You have just over a week left to get in on the action. 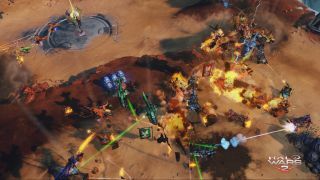 Wes Fenlon seemed to enjoy his time with Halo Wars 2 at a preview event the other week, and before you proceed you should probably check out his video impressions of the Halo-but-an-RTS?! sequel. Actually, before that it might be best to get the beta downloading, as it's just shy of 12GB and, for most of us, that's still a hefty chunk of data to usher down our inter-pipes. Halo Wars 2's long-teased beta is finally available for all, but only until January 30. It allows you to play on the game's newly fangled Blitz mode, which mixes trad. real-time-strategy with collectible-card-game stuff—an interesting combination and, yep, one with card packs and microtransactions to optionally spend your money on. You'll find the system specs over at the download page, and at the very least you'll need Windows 10 and an Intel i5-2500/AMD FX-4350 to be able to run it. The full game will be out on February 21, and as The Creative Assembly is developing it, it might actually be one to keep an eye on.